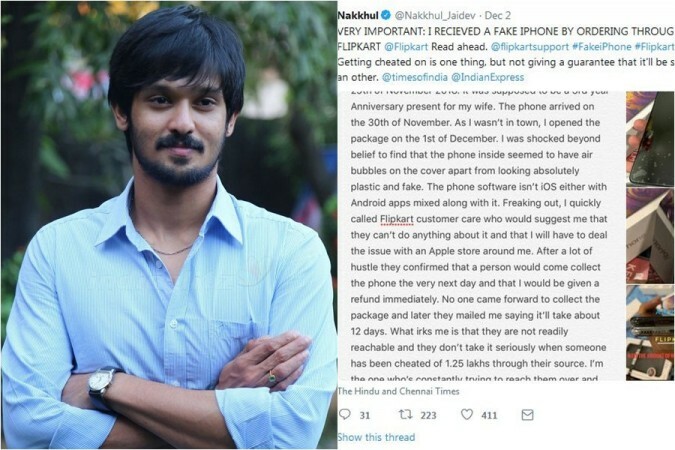 Tamil actor Nakkhul Jaidev says that the phone delivered to him by the e-commerce site is fake and that Flipkart is not responding to his claim. Tamil actor Nakkhul Jaidev has alleged that the Rs 1,19,900 worth iPhone XS MAX, which he wanted to present to his wife and purchased from Flipkart on 30 November turned out to be fake. Nakkhul took to his Twitter page on December 2 to share his online shopping experience with Flipkart. He shared some photos and wrote, "VERY IMPORTANT: I RECEIVED A FAKE IPHONE BY ORDERING THROUGH FLIPKART @Flipkart Read ahead. @flipkartsupport #FakeiPhone #Flipkart Getting cheated on is one thing, but not giving a guarantee that it'll be solved is another. @timesofindia @IndianExpress"
In one of the photos, Nakkhul explained his bitter experience with Flipkart. He says that he immediately called Flipkart customer service when he received his package, but the executive who took his call reportedly said that the company can't do anything about it. I ordered an iPhone XS MAX (256GB) from FlipKart on the 29th of November 2018. It was supposed to be a 3rd year Anniversary present for my wife. The phone arrived on the 30th of November. As I wasn't in town, I opened the package on the 1st of December. I was shocked beyond belief to find that the phone inside seemed to have air bubbles on the cover apart from looking absolutely plastic and fake. The phone software isn't iOS either with Android apps mixed along with it. Freaking out, I quickly called Flipkart customer care who would suggest me that they can't do anything about it and that I will have to deal the issue with an Apple store around me. After a lot of hustle they confirmed that a person would come collect the phone the very next day and that I would be given a refund immediately. No one came forward to collect the package and later they mailed me saying it'll take about 12 days. What irks me is that they are not readily reachable and they don't take it seriously when someone has been cheated of 1.25 lakhs through their source. I'm the one who's constantly trying to reach them over and over again. I'm hoping Flipkart will take this seriously and give me an assurance that people won't be cheated so easily. PS. The vendor I got it from through Flipkart had a "Flipkart Assured" badge too.